Last year, the Reds’ season was painful. I’d entered it with hopes of them doing something. I was wrong, so very wrong, and I found it difficult to laugh at all the stupid things. Not this year! This year I’m ready. Where to begin? How about right here. Cincinnati has 34 healthy players, plus two that are injured, remaining on its Spring Training roster. With two days left in camp, nine more have to go to reach the 25-man limit. Wow. Really? I can’t remember a team ever having that many players so late in camp. I mean, the Cubs, of all teams, are busy cutting down to their final 25. The Cubs! And the Reds have 34? Surely the GM realizes the ludicrousness of this. 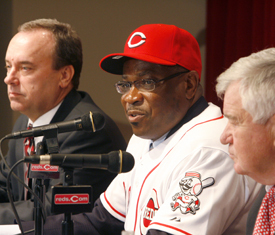 “We will have 25 when Opening Day starts,” Reds general manager Wayne Krivsky said. What refreshing candor. So nice to hear that you’ll be waiting until the last minute to do your job! I should have seen it coming, but I didn’t. I can’t imagine what kind of disease it is that infects these Reds managers with this 3 catchers notion (*cough*waynekrivsky*cough*). All one has to do is look around at teams that have won any worthwhile games in the last decade and counted how many catchers they had. I’ll even give them one free hint: It wasn’t three. As I grow older, I grow less tolerant of repeated acts of stupidity and willful ignorance. The Reds, posing as the oldest professional ball club, do not. For that, I salute them. I look forward to them helping me achieve my quota of laughs throughout the coming season.